"Inspired by my favorite local Italian restaurant's secret recipe. After some trial and error, I think I have it. Creamy Alfredo sauce and salmon complement each other well. Spinach adds great color." Bring a large pot of lightly salted water to a boil. Add fettuccine, and cook for 11 to 13 minutes or until al dente; drain. In a medium saucepan over medium heat, melt the butter, and blend with milk. Mix in the flour to thicken. Gradually stir in the Parmesan cheese until melted. Crumble salmon into the butter mixture. 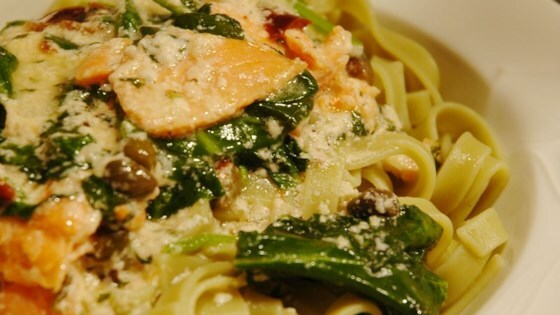 Stir in the spinach, capers, sun-dried tomatoes, and oregano. Cook and stir about 3 minutes, until heated through. Serve over the cooked pasta. Excellent recipe! Great way to use left over salmon steaks. I recommend subsituting cream cheese instead of butter- this is a restaraunt quality recipe. I grilled a piece of salmon and omitted the flour and milk and used heavy cream instead. I also used 1tsp dried oregano. My husband loved it. I did not try it because I don't like salmon.